Brian Hall, one of the Shankly 'babes' of the 1960s, is now employed as Community Liaison Manager at Anfield, and learnt some fascinating insights into the workings of the Boot Room in those days 'when we were fab'. instantly recognise. Across the narrow strip of car park separating the tight Victorian terracing of Anfield's streets from one of the most famous pieces of turf in the world, animated school kids jostle each other to grab a treasured autograph from one of their footballing heroes, maybe Jamie, or Robbie, or perhaps best of all Michael. The names and demeanour of the gladiators may have changed, but the familiar sight of Liverpool's young stars taking time out with the next generation of kopites is one that Shanks would have approved of. Inside the office, an ex player, one of the bright young starlets of Shankly's second great Liverpool team recalls the 'privilege' he felt at being part of the most momentous period in the club's history. Actually, not so much one of the bright young starlets, but more the serious young man, who had managed to reach the age of 22 before making his mark in the professional game. It was April 1969, when Bill Shankly gave university graduate Brian Hall his Liverpool debut at Stoke City's Victoria Ground. For Brian Hall's rise to prominence as a pro footballer did not follow the more traditional routes of his team mates. Hall explains, "It was my first season as a professional. I had come to study mathematics at Liverpool University in the mid 60s, mainly because I was a Beatles nut and just had to go and live in the city. A friend of mine arranged a trial for me at Liverpool and I went along not knowing what to expect. They signed me on and I played for three years as an amateur whilst I carried out my university course. I came on as a replacement for Roger Hunt in that first match. Roger had picked up a shoulder injury and come off at half time but all I can remember doing once I went on is lots of running around and getting kicked by the Stoke City left-back, a guy called Alec Elder." It was a further 2 years before Brian Hall really announced his arrival. He was the hero of the 1971 F.A. Cup semi final against Everton, scoring a late winner in front of 62,000 fans at Old Trafford, to send the reds into a Wembley final against double chasing Arsenal. Sadly, the side weren't quite ready to topple the Londoners and Arsenal duly claimed the double that afternoon though not before Shankly's young charges had dragged them through extra time. "I never really had a close relationship with Bill in those days. I was in awe of him really. He would walk into a room full of international players like Roger Hunt and Ian St. John, and even they would fall silent, such was his presence. The only players I think who really built up a close working relationship with him were Kevin Keegan and perhaps Emlyn Hughes." One of the few players to bridge the gap between the great 60s team and the European conquering 70s sides, Hall was perfectly placed to witness the development of the simple, passing style that has characterised Liverpool's play ever since. "What they taught us had to be innate. It was that simplistic approach where we did the same things day in day out, week in week out at Melwood, until it was ingrained. You knew what to do in any particular situation. It was so simple, you just passed to the nearest red shirt." The simplistic approach was at odds with Hall's other life at university. "I spent 21 years of my life being educated and going from 1+1=2, to x+y=6 and then onto vector spaces and quantum theory. The higher up the educational ladder I got the more complex it became, but at Melwood they turned that philosophy upside down. The football teaching became less complex the further up I got. The game is essentially a very simple one." Hall now does his work at Anfield in the guise of Community Liaison Manager, a role which encompasses running the International Supporters Club. It's a position he is clearly suited to and one that reflects the changes the game has undergone. "It's a totally different business now". Arguably, Shankly was the first to hold such an office at the club although of course the title never actually existed back then. Hall understands as much as anyone the role Shankly played in bringing the club and it's fans together. "He was the right man for the right time." Not that everything was plain sailing. "We would have our rows. He would have his say and I'd have mine, but half an hour later it was forgotten." Hall's most famous run in with Shankly occured in the 1972-73 season. Liverpool had reached the final of the UEFA Cup and faced German side Borussia Moenchengladbach in a two legged affair, the first being at Anfield. The first match only lasted half and hour because the pitch became waterlogged after a torrential downpour, and the game was re-scheduled for the following night. In that half hour though, Shankly had spotted a weakness in the air in the German back line and for the rematch brought in the aerial supremacy of John Toshack at the expense of Hall's attacking midfield play. "My reaction was childish. I just slammed about and wasn't really in the best frame of mind to be on the subs bench. Of course we won the match 3:0 and it was viewed as a master stroke by Shanks but I was still unhappy. It rumbled on to the end of the season where it finally came to a head when I was dropped for the final game against Leicester City. We only needed a draw for the title and Shanks decided to blood a young Phil Thompson at my expense. That incident hit me far harder than the UEFA Cup final one had done. Again though, he got the result and everyone was happy but my reaction was wrong even though we had won the title." Hall had so much respect for Shankly however, that he would never remain angry with him for long. 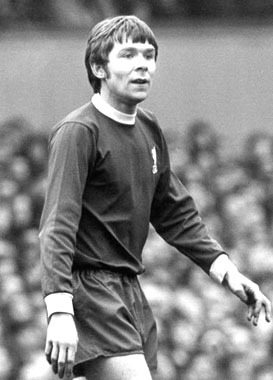 The following season, 1973-74 saw the start of his best run in the red shirt. He would be a mainstay of the midfield for the next two years. "When I first arrived at the club, I had quickly learned a hard reality, and I mean quickly. I was living in this hi-falutin, intellectually rarified atmosphere at university and on the other hand I was getting kicked up in the air on a Saturday afternoon and getting absolutely blasted by the manager aftwerwards and it was a very real and immediate world. If you had a poor game he would let rip in the dressing room but once he went outside to face the press guys, he would tell them what a great player you were. That inspired great respect."